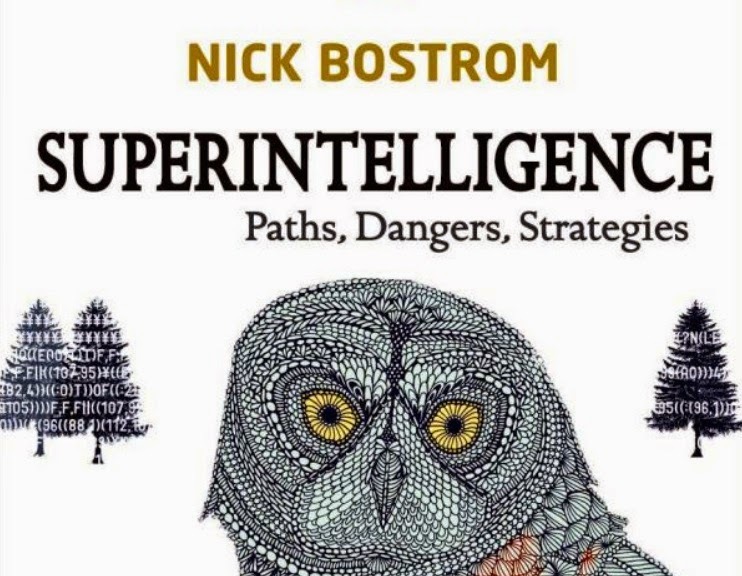 This is the sixth part in my series on Nick Bostrom’s recent book Superintelligence: Paths, Dangers, Strategies. The series is covering those parts of the book that most interest me. This includes the sections setting out the basic argument for thinking that the creation of superintelligent AI could threaten human existence, and the proposed methods for dealing with that threat. I’m currently working through chapter 9 of the book. In this chapter, Bostrom describes the “Control Problem”. This is the problem that human engineers and developers have when they create a superintelligence (or, rather, when they create the precursor to a superintelligence). Those engineers and developrs will want the AI to behave in a manner that is consistent with (perhaps even supportive of) human flourishing. But how can they ensure that this is the case? As noted the last day, there are two general methods of doing this. The first is to adopt some form of “capability control”, i.e. limit the intelligence’s capabilities so that, whatever its motivations might be, it cannot pose a threat to human beings. We reviewed various forms of capability control in the previous post. The second is to adopt some form of “motivation selection”, i.e. ensure that the AI has benevolent (or non-threatening) motivations. We’ll look at this today. In doing so, we’ll have to contend with four possible forms of motivation selection. They are: (i) direct specification; (ii) domestication; (iii) indirect normativity; and (iv) augmentation. I’ll explain each and consider possible advantages and disadvantages. 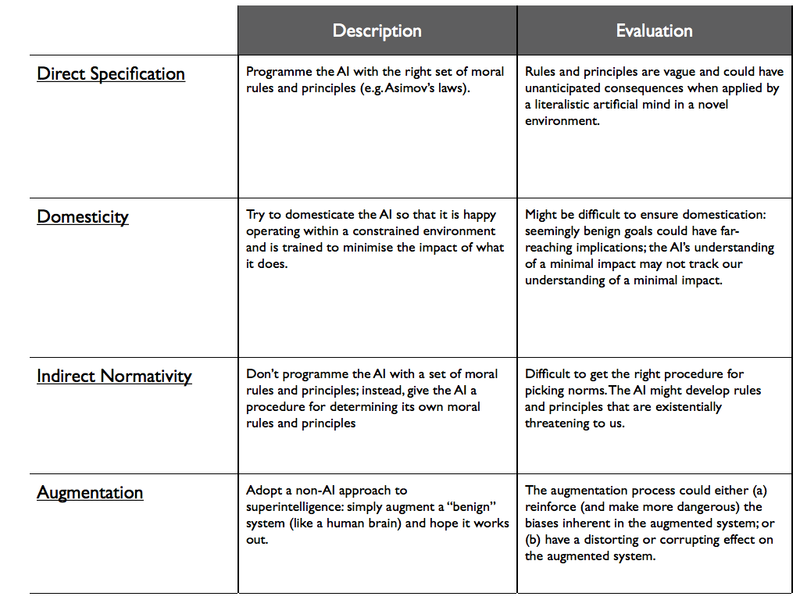 The direct specification method — as name suggests — involves directly programming the AI with the “right” set of motivations. The quintessential example of this is Isaac Asimov’s three (or four!) laws of robotics, from his “Robot” series of books and short stories. As you may know, in these stories Asimov imagined a future in which robots are created and programmed to follow a certain set of basic moral laws. The first one being “A robot may not injure a human being or allow, through inaction, a human being to come to harm”. The second one being “A robot must obey any orders given to it by human beings, except where such orders would conflict with the First Law”. And so on (I won’t go through all of them). At first glance, laws of this sort seem sensible. What could go wrong if a robot was programmed to always follow Asimov’s first law? Of course, anyone who has read the books will know that lots can go wrong. Laws and rules of this sort are vague, open to interpretation. In specific contexts they could be applied in very odd ways, especially if the robot has a very logical or literalistic mind. Take the first law as an example. It says that a robot may not, through inaction, allow any human to come to harm. This implies that the robot must be at all times seeking to avoid possible ways in which humans could come to harm. But humans come to harm all the time. How can we stop it? A superintelligent robot, with a decisive advantage over human beings, might decide that the safest thing to do would be to put all humans into artificially induced comas. It wouldn’t be great for them, but it would prevent them from coming to harm. Now, you may object and say that this is silly. We could specify the meaning of “harm” in such a way that it can avoid the induced coma outcome. And maybe we could, but as Bostrom points out, quoting from Bertrand Russell, “everything is vague to a degree you do not realize till you have tried to make it precise”. In other words, adding one exception-clause or one-degree of specification doesn’t help to avoid other possible problems with vagueness. Anyone who has studied the development and application of human laws will be familiar with this problem. The drafters of those laws can never fully anticipate every possible future application: the same will be true for AI programmers and coders. I should note that Richard Loosemore has recently penned a critique of this problem, but I have not yet had the time to grapple with it. The second suggested method of motivation selection is called “domesticity”. The analogy here might be with the domestication of wild animals. Dogs and cats have been successfully domesticated and tamed from wild animals over the course of many generations; some wild animals can be successfully domesticated over the course of their lifespan (people claim this for all sorts of creatures though we can certainly doubt whether it is really true of some animals, e.g. tigers). Domestication means that the animals are trained (or bred) to lack the drive or motivation to do anything that might harm their human owners: they are happy to operate within the domestic environment and their behaviour can be controlled in that environment. The classic example of a domesticated superintelligence would be the so-called “oracle” device. This functions as a simple question-answering system. Its final goal is to produce correct answers to any questions it is asked. It would usually do so from within a confined environment (a “box”). This would make it domesticated, in a sense, since it would be happy to work in a constrained way within a confined environment. But, of course, things are not so simple as that. Even giving an AI the seemingly benign goal of giving correct answers to questions could have startling implications. Anyone who has read the Hitchhiker’s Guide to the Galaxy knows that. In that story, the planet earth is revealed to be a supercomputer created by an oracle AI in order to formulate the “ultimate question” — the meaning of life, the universe and everything — having earlier worked out the answer (“42”). The example is silly, but it highlights the problem of “resource acquisition”, which was mentioned earlier in this series: making sure one has the correct answers to questions could entail the acquisition of vast quantities of resources. There might be ways around this, and indeed Bostrom dedicates a later chapter to addressing the possibility of an oracle AI. 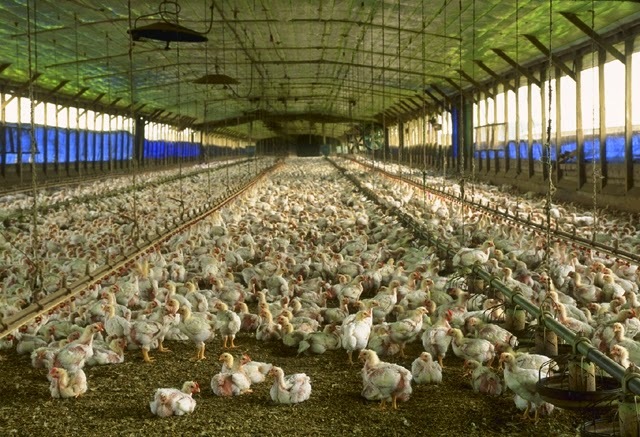 Nevertheless, there is a basic worry about the domestication strategy that needs to be stated: the AI’s understanding of what counts as a minimised and constrained area of impact needs to be aligned with our own. This presents a significant engineering challenge. The third possible method of motivation selection is indirect normativity. The idea here is that instead of directly programming ethical or moral standards into the AI, you give it some procedure for determining its own ethical and moral standards. If you get the procedure just right, the AI might turn out to be benevolent and perhaps even supportive of human interests and needs. Popular candidates for such a procedure tend to be modelled on something like the ideal observer theory in ethics. The AI is to function much like an ideal, hyper-rational human being who can “achieve that which we would have wished the AI to achieve if we had thought about the matter long and hard” (Bostrom, 2014, p. 141). Bostrom doesn’t say a whole lot about this in chapter 9, postponing a fuller discussion to a later chapter. But as I noted in one of my previous posts on this topic, one of the main problems with this method of motivation selection is ensuring you’ve got the right norm-picking procedure. Getting it slightly wrong could have devastating implications, particularly if the machine has a decisive strategic advantage over us. As Bostrom notes, augmentation might look pretty attractive if all other methods turn out to be too difficult to implement. Furthermore, it might end up being a “forced choice”. If augmentation is the only route to superintelligence, then augmentation is, by default, the only available method of motivation selection. Contrariwise, if the route to superintelligence is via the development of AI, augmentation is not on the cards. In any event, as a “solution” to the control problem, augmentation leaves a lot to be desired. If the system we augment has some inherent biases or flaws, we may simply end up exaggerating those flaws through a series of augments. It might be wonderful to augment a Florence Nightingale to superintelligence, but it might be nightmarish to do the same with a Hitler. Furthermore, even if the starter-system is benevolent and non-threatening, the process of augmentation could have a corrupting effect. A super-rational, super-intelligent human being, for instance, might end up being an anti-natalist and might decide that human annihilation is the morally best outcome. Okay, so that it’s for this post. The table below summarises the various motivation selection methods. This might be it for my series on Bostrom’s book. If I have the time, I may do two more on chapter 10, but that’s looking less viable every day. We’re all familiar with the headlines by now: “Robots are going to steal our jobs”, “Automation will lead to joblessness”, and “AI will replace human labour”. It seems like more and more people are concerned about the possible impact of advanced technology on employment patterns. Last month, Lawrence Summers worried about it in the Wall Street Journal but thought maybe the government could solve the problem. Soon after, Vivek Wadhwa worried about it in the Washington Post, arguing that there was nothing the government could do. Over on the New York Times, Paul Krugman has been worrying about it for years. The Value Question: Would long-term technological unemployment be a bad thing (for us as individuals, for society etc)? I think the answer to the value question is a complex one. There are certainly concerns one could have about technological unemployment — particularly its tendency to exacerbate social inequality — but there are also potential boons — freedom from routine drudge work, more leisure time and so on. It would be worth pursuing these issues further. Nevertheless, in this post I want to set the value question to one side. This is because the answer to that question is going to depend on the answer to the factual question: there is no point worrying or celebrating technological unemployment if its never going to happen. So what I want to do is answer the factual question. More precisely, I want to try to evaluate the arguments for and against the likelihood of technological unemployment. I’ll start by looking at an intuitively appealing, but ultimately naive, argument in favour of technological unemployment. As I’ll point out, many mainstream economists find fault with this argument because they think that one of the assumptions it rests on is false. I'll then outline five reasons for thinking that the mainstream view is wrong. This will leave us with a more robust argument for technological unemployment. I will reach no final conclusion about the merits of that argument. As with all future-oriented debates, I think there is plenty of room for doubt and disagreement. I will, however, suggest that the argument in favour of technological unemployment is a plausible one and that we should definitely think about the possible future to which it points. My major reference point for all this will be the discussion of technological unemployment in Brynjolfsson and McAfee’s The Second Machine Age. If you are interested in a much longer, and more detailed, assessment of the relevant arguments, might I suggest Mark Walker’s recent article in the Journal of Evolution and Technology? 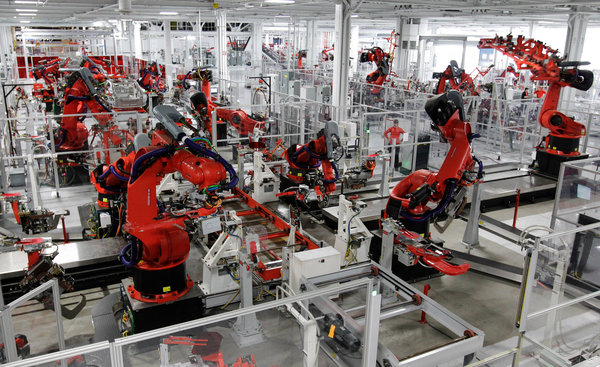 To start off with, we need to get clear about the nature of technological unemployment. In its simplest sense, technological unemployment is just the replacement of human labour by machine “labour” (where the term “machine” is broadly construed and where one can doubt whether we should call what machines do “labour”). This sort of replacement happens all the time, and has happened throughout human history. In many cases, the unemployment that results is temporary: either the workers who are displaced find new forms of work, or, even if those particular workers don’t, the majority of human beings do, over the long term. Contemporary debates about technological unemployment are not concerned with this temporary form of unemployment; instead, they are concerned with the possibility of technology leading to long-term structural unemployment. This would happen if displaced workers, and future generations of workers, cannot find new forms of employment, even over the long-term. This does not mean that there will be no human workers in the long term; just that there will be a significantly reduced number of them (in percentage terms). Thus, we might go from a world in which there is a 10% unemployment rate, to a world in which there is a 70, 80 or 90% unemployment rate. The arguments I discuss below are about this long-term form of technological unemployment. (1) Advances in technology are replacing more and more forms of existing human labour. (2) Therefore, there will be technological unemployment. The problem with this argument is that it is formally invalid. This is the case with all enthymemes. We are not entitled to draw that conclusion from that premise alone. Still, formal invalidity will not always stop someone from accepting an argument. The argument might seem intuitively appealing because it relies on a suppressed or implied premise that people find compelling. We’ll talk about that suppressed premise in a moment, and why many economists doubt it. Before we do that though, it’s worth briefly outlining the case for premise (1). That case rests on several different strands of evidence. The first is just a list of enumerative examples, i.e. cases in which technological advances are replacing existing forms of human labour. You could probably compile a list of such examples yourself. Obviously, many forms of manufacturing and agricultural labour have already been replaced by machines. This is why we no longer rely on humans to build cars, plough fields and milk cows (there are still humans involved in those processes, to be sure, but their numbers are massively diminished when compared with the past). Indeed, even those forms of agricultural and manufacturing labour that have remained resistant to technological displacement — e.g. fruit pickers — may soon topple. There are other examples too: machines are now replacing huge numbers of service sector jobs, from supermarket checkout workers and bank tellers, to tax consultants and lawyers; advances in robotic driving seem likely to displace truckers and taxi drivers in the not-too-distant future; doctors may soon see diagnostics outsourced to algorithms; and the list goes on and on. In addition to these examples of displacement, there are trends in the economic data that are also suggestive of displacement. Brynjolfsson and McAfee outline some of this in chapter 9 of their book. One example is the fact that recent data suggests that in the US and elsewhere, capital’s share of national income has been going up while labour’s share has been going down. In other words, even though productivity is up overall, human workers are taking a reduced share of those productivity gains. More is going to capital, and technology is one of the main drivers of this shift (since technology is a form of capital). Another piece of evidence comes from the fact that since the 1990s recessions have, as per usual, been followed by recoveries, but these recoveries have tended not to significantly increase overall levels of employment. This means that productivity gains are not matched by employment gains. Why is this happening? Again, the suggestion is that businesses find that technology can replace some of the human labour they relied on prior to the recession. There is consequently no need to rehire workers to spur the recovery. This seems to be especially true of the post-2008 recovery. (3) Nowhere to go: If technology replaces all existing forms of human labour, and there are no other forms of work for humans to go to, then there will be technological unemployment. This plugs the logical gap in the initial argument. But it does so at a cost. The cost is that many economists think that the “nowhere to go” claim is false. Indeed, they even have a name for it. They call it the “Luddite fallacy”, inspired in that choice of name by the Luddites, who protested against the automation of textile work during the Industrial Revolution. History seems to suggest that the Luddite concerns about unemployment were misplaced. Automation has not, in fact, led to increased long-term unemployment. Instead, human labour has found new uses. What’s more, there appear to be sound economic reasons for this, grounded in basic economic theory. The reason why machines replace humans is that they increase productivity at a reduced cost. In other words, you can get more for less if you replace a human worker with a machine. This in turn reduces the costs of economic outputs on the open market. When costs go down, demand goes up. This increase in demand should spur the need or desire for more human workers, either to complement the machines in existing industries, or to assist entrepreneurial endeavours in new markets. (4) Theoretical Rebuttal: Economic theory suggests that the increased productivity from machine labour will reduce costs, increase demand, and expand opportunities for existing or novel forms of human labour. (5) Evidential Rebuttal: Accumulated evidence, over the past 200 years, suggests that technological unemployment is at most a temporary problem: humans have always seemed to find other forms of work. Are these rebuttals any good? There are five reasons for thinking they aren’t. (6) The Inelastic Demand Problem: The theoretical rebuttal assumes that demand for outputs will be elastic (i.e. that reductions in price will lead to increases in demand), but this may not be true. It may not be true for particular products and services, and it may not be true for entire industries. Historical evidence seems to bear out this point. Let’s go through this in a little more detail. The elasticity of demand is a measure of how sensitive demand is to changes in price. The higher the elasticity, the higher the the sensitivity; the lower the elasticity, the lower the sensitivity. If a particular good or service has a demand elasticity of one, then for every 1% reduction in price, there will be a corresponding 1% increase in demand for that good or service. Demand is inelastic when it is relatively insensitive to changes in price. In other words, consumers tend to demand about the same over time (elasticity of zero). 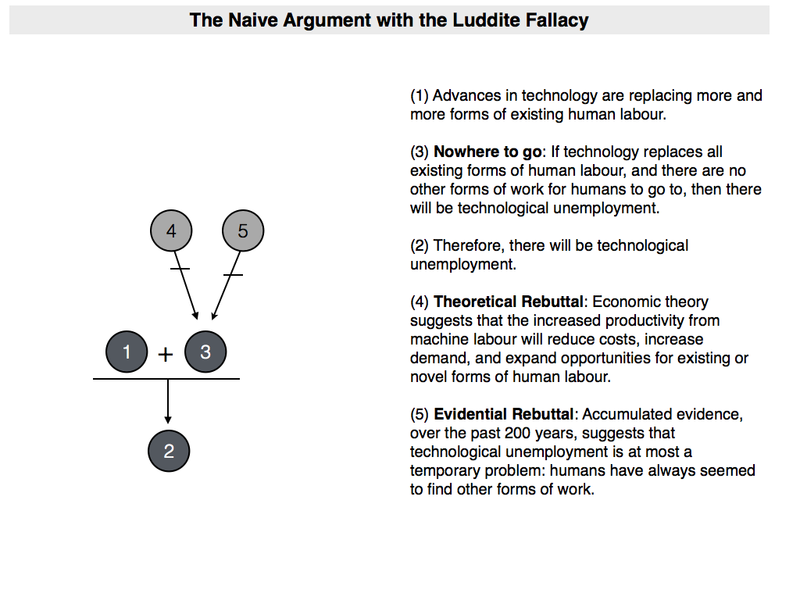 The claim made by proponents of the Luddite fallacy is that the demand elasticity for human labour, in the overall economy, is around one, over the long haul. But as McAfee and Brynjolfsson point out, that isn’t true in all cases. There are particular products for which there is pretty inelastic demand. They cite artificial lighting as an example: there is only so much artificial lighting that people need. Increased productivity gains in the manufacture of artificial lighting don’t result in increased demand. Similarly, there are entire industries in which the demand elasticity for labour is pretty low. Again, they cite manufacturing and agriculture as examples of this: the productivity gains from technology in these industries do not lead to increased demand for human workers in those industries. Of course, lovers of the Luddite fallacy will respond to this by arguing that it doesn’t matter if the demand for particular goods or services, or even particular industries, is inelastic. What matters is whether human ingenuity and creativity can find new markets, i.e. new outlets for human labour. They argue that it can, and, more pointedly, that it always has. The next two arguments against the Luddite fallacy give reason to doubt this too. (7) The Outpacing Problem: The theoretical rebuttal assumes that the rate of technological improvement will not outpace the rate at which humans can retrain, upskill or create new job opportunities. But this is dubious. It is possible that the rate of technological development will outpace these human abilities. I think this argument speaks for itself. For what it’s worth, when JM Keynes first coined the term “technological unemployment”, it was this outpacing problem that he had in mind. If machines displace human workers in one industry (e.g. manufacturing) but there are still jobs in other industries (e.g. computer programming), then it is theoretically possible for those workers (or future generations of workers) to train themselves to find jobs in those other industries. This would solve the temporary problem of automation. But this assumes that humans will have the time to develop those skills. In the computer age, we have witnessed exponential improvements in technology. It is possible that these exponential improvements will continue, and will mean that humans cannot redeploy their labour fast enough. Thus, I could encourage my children to train to become software engineers, but by the time they developed those skills, machines might be better software engineers than most humans. (8) The Inequality Problem: The technological infrastructure we have already created means that less human labour is needed to capture certain markets (even new ones). Thus, even if people do create new markets for new products and services, it won’t translate into increased levels of employment. This one takes a little bit of explanation. There are two key trends in contemporary economics. First is the fact that an increasing number of goods and services are being digitised (with the advent of 3D printing, this now include physical goods). Digitization allows for those goods and services to be replicated at near zero marginal cost (since it costs relatively little for a digital copy to be made). If I record a song, I can have it online in an instant, and millions of digital copies can be made in a matter of hours. The initial recording and production may cost me a little bit, but the marginal cost of producing more copies is virtually zero. A second key trend in contemporary economics is the existence of globalised networks for the distribution of goods and services. This is obviously true of digital goods and services, which can be distributed via the internet. But it is also true of non-digital goods, which can rely on vastly improved transport networks for near-global distribution. These two trends have led to more and more “winner takes all” markets. In other words, markets in which being the second (or third or fourth…) best provider of a good or service is not enough: all the income tends to flow to one participant. Consider services like Facebook, Youtube, Google and Amazon. They dominate particular markets thanks to globalised networks and cheap marginal costs. Why go to the local bookseller when you have the best and cheapest bookstore in the world at your fingertips? 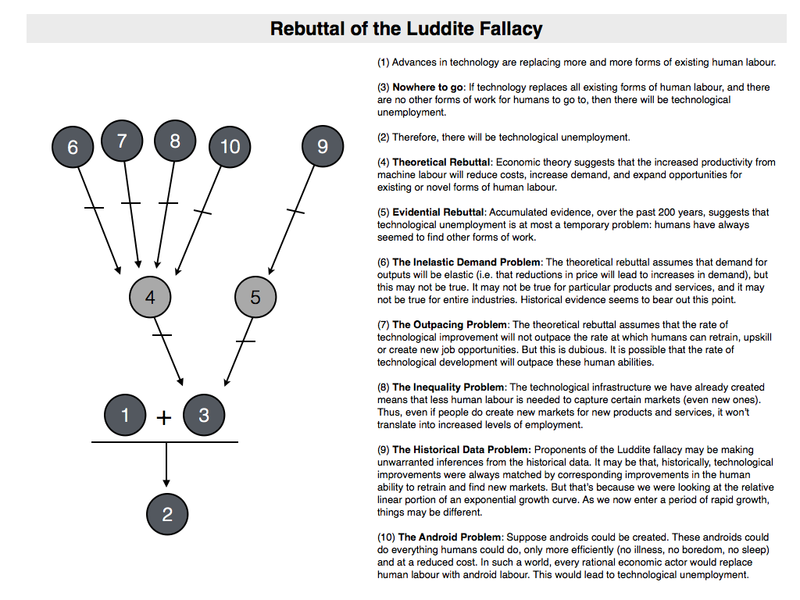 (9) The Historical Data Problem: Proponents of the Luddite fallacy may be making unwarranted inferences from the historical data. It may be that, historically, technological improvements were always matched by corresponding improvements in the human ability to retrain and find new markets. But that’s because we were looking at the relative linear portion of an exponential growth curve. As we now enter a period of rapid growth, things may be different. In essence, this is just a repeat of the point made earlier about the outpacing problem. The only difference is that this time it is specifically targetted at the use of historical data to support inferences about the future. That said, Brynjolfsson and McAfee do suggest that recent data support this argument. As mentioned earlier, since the 1990s job growth has “decoupled” from productivity: the number of jobs being created is not matching the productivity gains. This may be the first sign that we have entered the period of rapid technological advance. (10) The Android Problem: Suppose androids could be created. These androids could do everything humans could do, only more efficiently (no illness, no boredom, no sleep) and at a reduced cost. In such a world, every rational economic actor would replace human labour with android labour. This would lead to technological unemployment. The reason why this thought experiment is relevant here is that there doesn’t seem to be anything unfeasible about the creation of androids: it could happen that we create such entities. If so, there is reason to think technological unemployment will happen. What’s more, this could arise even if the androids are not perfect facsimiles of human beings. It could be that there are one or two skills that the androids can’t compete with humans on. Even still, this will lead to a problem because it will mean that more and more humans will be competing for jobs that involve those one or two skills. So there you have it: an argument for technological unemployment. At first, it was naively stated, but when defended from criticism, it looks more robust. It is indeed wrong to assume that the mere replacement of existing forms of human labour by machines will lead to technological unemployment, but if the technology driving that replacement is advancing at a rapid rate; if it is built on a technological infrastructure that allows for “winner takes all” markets; and if ultimately it could lead to the development of human-like androids, then there is indeed reason to think that technological unemployment could happen. Since this will lead to a significant restructuring of human society, we should think seriously about its implications. At least, that’s how I see it right now. But perhaps I am wrong? There are a number of hedges in the argument — we’re predicting the future after all. Maybe technology will not outpace human ingenuity? Maybe we will always create new job opportunities? Maybe these forces will grind capitalism to a halt? What do you think? Debate about the merits of enhancement tends to be pretty binary. There are some — generally called bioconservatives — who are opposed to it; and others — transhumanists, libertarians and the like — who embrace it wholeheartedly. Is there any hope for an intermediate approach? One that doesn’t fall into the extremes of reactionary reject or uncritical endorsement? Probably. 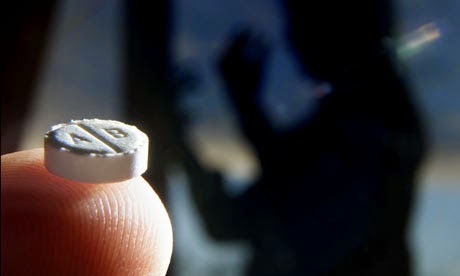 Indeed, a careful reading of many pro- and anti-enhancement writers suggests that they are not, always and everywhere, in favour or against the use of enhancement. But to sustain the intermediate approach, we need some framework for deciding when enhancement is permissible and when it is not. In their paper, “Who Should Enhance? Conceptual and Normative Dimensions of Cognitive Enhancement”, Filippo Santoni di Sio, Philip Robichaud and Nicole Vincent try to provide one such framework. They base it on set of tools for determining the “nature of an activity”. They argue that for certain practice-oriented activities, the use of cognitive enhancement may not be permissible, but for goal-directed activities, it probably is permissible (maybe even obligatory). In this post I want to outline their proposed framework, and offer some (minor) critical comments along the way. On the whole, I find the approach promising, but I think there are some practical difficulties (as I will explain). I’ll divide my discussion into two parts. First, I’ll set out the conceptual toolkit proposed by the authors for analysing human activities. Second, I’ll explain the implications of this toolkit for the enhancement debate. Santoni di Sio and his colleagues claim that the permissibility of cognitive enhancement depends on the nature of the activity we are interested in. To back this up, they present us with a toolkit of concepts for understanding the nature of an activity. This toolkit consists of three pairs of related concepts. The first pair of concepts is the distinction between practice-oriented activities and goal-oriented activities. This is probably the most important pair of concepts and forms the backbone of their approach to understanding the permissibility/impermissibility of cognitive enhancement. The idea is that every human activity has definitional limits, i.e. qualities or attributes that render it distinct from other activities. “Walking” is distinct from “running”; “trading on the stock exchange” is distinct from “performing surgery”; “engaging in academic research” is distinct from “being educationally assessed”. At a very broad level, one of the key differentiators of activities is whether the activities are externally-focused or internally-focused. That is to say, whether they are concerned with producing or bringing about a certain outcome, or engaging in a particular kind of performance. Arguably, performing surgery is an externally-focused activity. We care about surgery to the extent that it produces a particular kind of outcome: healing or curing the patient. The precise manner in which it is performed matters less. Indeed, surgical techniques and methods are evolving all the time, usually with the explicit goal of improving patient-outcomes. Contrariwise, running the 100m sprint is, arguably, an internally-focused activity. There is an outcome that we care about, to be sure (viz. who crosses the line first), but we care about the way in which that outcome is brought about even more. You must run down the track in order to perform that activity; you cannot rollerblade or cycle. Still, as the sprinting example suggests, there is some need for nuance here. Most human activities are hybrid in nature: they are partially externally-focused and partially internally-focused. To get around this problem, Santoni di Sio et al suggest that we can still look on activities as being predominantly externally-focused and predominantly internally-focused. The former they call goal-oriented activities; the latter they call practice-oriented activities. The second pair of concepts employed by Santoni di Sio and his colleagues is the distinction between constitutive rules and regulative rules. I’ve covered this many times before so I’ll just offer a brief explanation here. A regulative rule is one that ascribes certain standards of performance to an independently intelligible activity. The rules of the road, for example, are regulative. They take the activity of driving — which is intelligible in itself — and tell us how to perform that activity safely. Constitutive rules are different. They actually create (or “constitute”) an activity. Apart from those rules, the activity is not in itself intelligible. A classic example is the rules of chess. Those rules actually determine what it is to perform the activity of playing chess. Without those rules, you simply have the activity of moving bits of carved wood around a checkered board. You don’t have chess. Why is this distinction relevant to this debate? It is relevant because Santoni di Sio et al argue that goal-oriented activities are governed by regulative rules, whereas practice-oriented activities are governed by constitutive rules. A goal-oriented activity like surgery is all about the production of a particular outcome. There are no internal limits on how it can be performed. Consequently, the only standards that are applied to it are regulative in nature: they tell us how to perform surgery safely and ethically. A practice-oriented activity is different. It does have some internal limits on how it can be performed. Consequently, it must be governed (at least in part) by constitutive rules, i.e. rules that specify what the activity is to be. The third and final pair of concepts employed by Santoni di Sio and his colleagues is the distinction between coarse-grained and fine-grained descriptions of activities. A coarse-grained description of an activity abstracts away from most of the particular details of the performance, and focuses instead on general, macroscopic features of the performance. A fine-grained description is the opposite: it doesn’t abstract from particular details. Obviously, these are not binary categories: descriptions exist along a continuum from the extremely fine-grained to the extremely coarse-grained. Why is this important? Santoni di Sio et al think that, when it comes to practice-oriented activities, the level of description can make a normative difference. They use an example involving car racing; I’ll use an example involving golf (which I am more familiar with). Imagine how golf was played 150 years ago. It was played on poorly-kept courses, with gutta-percha (rubber-like) balls that became misshapen with use, and with wooden clubs (with wooden or steel shafts). Now think about how golf is played today. It is played (usually) on well-kept courses, with durable multi-layered, synthetic golf balls, and with titanium and graphite golf clubs. At a coarse-grained level, golf is still the same game it always was: it is about getting a ball into a hole. But at a more fine-grained level, it is a different game: the changes in technology and course preparation have seen to that. The question that needs to be asked is whether those changes somehow subvert the practice-oriented point of the game. For the most part they do not. We have, after all, tolerated most of these technological changes. But sometimes they do. This is why certain types of golf-related technologies have been banned (e.g. club faces with a high COR or distance finders in competitive play). They are thought to subvert or alter the nature of the activity. With the conceptual toolkit in place, we can now build the ethical framework. I think the easiest way to do this is to imagine it as a flow-chart. You start with a given activity (e.g. academic research, surgery, education, financial trading etc.). 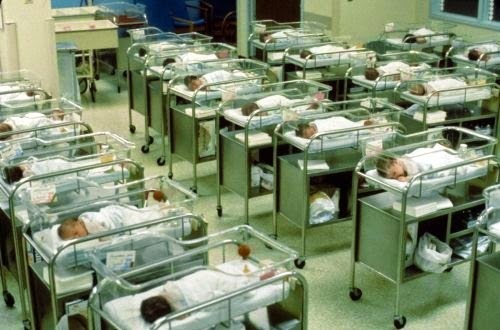 You then proceed through a series of nodes on the flow chart. At each node in the flow-chart you ask and answer a question. At the end of the process you reach an ethical evaluation about the use of enhancement in that particular activity. …to realize whether a certain activity is goal- directed or practice-oriented…try to mentally eliminate either the realization of the internal or external goals of a given activity, and see which one would result in the loss of that activity’s point. Would it make sense, for instance, to go out with friends if one did not enjoy their company, or to play a certain game if one did not find the activity amusing or challenging or interesting? As the answer to both questions is negative (setting aside other goal like wishing to develop the friendship or to acquire an appreciation for the games), one may conclude that those are practice-oriented activities. This is an intuitively appealing test. You could probably also ask yourself whether the activity seems to be governed by regulative or constitutive rules. Nevertheless, I think there are problems lurking here. The reality is that activities might take on different characteristics for different performers. For example, it might seem natural to say that a sport like the 100m sprint or golf is practice-oriented. But is that true for all players? I suspect that for some professional athletes the external goods of the activity (the winning; the money; the sponsorship deals; the fame etc.) may swamp the internal ones. Thus, for them, the sport will seem very much like a goal-directed activity. This may, in turn, explain why some athletes adopt a “win at all costs” attitude. (Consider all the professional diving and fouling at this year’s World Cup). I suspect something similar may be true of certain students in university education. For them, education will be about outcomes (good grades and good jobs). They will care rather less about the internal goods of learning. You can, of course, argue that these athletes and students have a distorted view of the nature of their respective activities; that their attitude subverts and undermines the point of those activities. In that case you are presupposing some normative view of those activities that is independent of the attitudes of particular performers (and, perhaps, independent of the test proposed by Santoni di Sio and his colleagues). This may be the right perspective to adopt. Still, I think the different perspectives are worth bearing in mind. This for two reasons. First, there may be borderline or fuzzy cases where we’re just not sure what the correct categorisation is. Second, the fact that different performers will view the activity differently will make any proposed enhancement policy more or less difficult to implement. Leaving those criticisms to the side, let’s suppose that we can answer the initial question. In that case, we will have two diverging branches. Along one of those branches we will be dealing with practice-oriented activities, along the other we will be dealing with goal-directed activities. Let’s focus on practice-oriented activities for the time being. In order to determine whether the use of enhancement should be permissible or impermissible in practice-oriented activities, we have to ask two separate questions. First, is the activity one with some high social or moral value? In other words, is it something whose integrity we would like to preserve? In the case of education (which we will assume to be practice-oriented) we would probably say “yes”: it is something of high social value whose integrity we would like to preserve. In the case of something like stamp-collecting or amateur sudoko, we would probably say “no”: there is nothing of huge social or moral value hinging on the current way in which those activities are performed. What difference does this make? Well, if the activity is of low social or moral value, then we probably shouldn’t care all that much whether people use enhancers while performing it. If my father wants to use modafinil when solving his sudoko puzzles, then so be it. Its use should be permissible in this and similar cases (note: this is assuming there are no severe side effects). If, on the other hand, the action is of high social value, we proceed to the next question. That next question is: would the use of cognitive enhancement subvert the valuable point of the activity? In answering that question, we will need to look at different levels of description. If enhancement makes a difference at a coarse-grained level of description (i.e. if it seems to alter the activity at that abstract level), then it should probably be impermissible: in that case it is definitely subverting the point of the activity. If it makes a difference at a fine-grained level, then the issue is more complex. We will have to ask whether that description accurately captures the point of the activity. If it does, then once again we have reason to deem the use of enhancement impermissible. Santoni di Sio and his colleagues think that education might be one example of an activity where this is true. They suggest that education is about doing things with a certain kind of effort (i.e. with certain obstacles in place), and that the use of enhancers may reduce that effort (or remove those obstacles). The result would be that the point of education is undermined. I have say I find this dubious. I think we would need to be much more precise in our account of the “effort” required in education. And I think, given what we know about how existing cognitive enhancers work, it is unlikely that they really do subvert the point of education. That, however, is an argument for another time. So much for practice-oriented activities. Let’s switch focus now and consider goal-directed activities. The ethical analysis of these activities is much more straightforward. Basically, if the activity is goal-directed, then all that matters is whether the goal is attained, not how the activity is performed (except, of course, it should not be performed in a way that breaches other ethical standards). So, in a sense, we shouldn’t care about the use of enhancement in these activities: if it makes us more likely to attain the goal, we should be allowed to use it. Of course, that’s not quite true. We still have to ask ourselves the question: is the goal something of high social or moral value? If it is, then not only would enhancement be permissible, it may even be obligatory. For example, the goal of surgery is something of high moral and social value. If there is anything we could do to make it more likely that the surgery is successful we should do it. In fact, if the stakes are high enough, we might even be obliged to do it. For example, pretty much everyone would say that hand-washing is obligatory prior to surgery. Why? Because it reduces the risk of infection and the complications that could arise from that. But if the use of cognitive enhancers would have a similar positive effect, why wouldn’t that be obligatory too? Santoni di Sio and his colleagues argue that it could be, but only if the use of the enhancers is necessary, efficacious, easy and safe. In other words, only if it is proven that it does make the user more likely to reach the goal, there is no other way of achieving the same gains, and it doesn’t impose significant costs on the user (either in terms of effort or health). The “easy and safe” requirement may actually be overly-cautious: it may be that in certain cases even hard and unsafe practices are obligatory in order to achieve a particular goal. But it’s easier to make the argument for the easy and safe cases. That’s it for the ethical framework. A diagram depicting the flow chart and the conclusions it brings us to is depicted below. In summary, the notion that there is a “middle ground” in the enhancement debate is appealing, but it needs to be plausibly mapped out. Santoni di Sio and his colleagues have tried to do that with their “nature of activities” approach to the ethics of enhancement. Their claim is that working out the nature of a given activity can determine whether enhancement is permissible/impermissible/obligatory. Impermissibility Test: If the activity is (a) practice-oriented; (b) has a valuable point; and (c) the use of enhancement would subvert that point, then the use of enhancement should be impermissible in that particular activity. 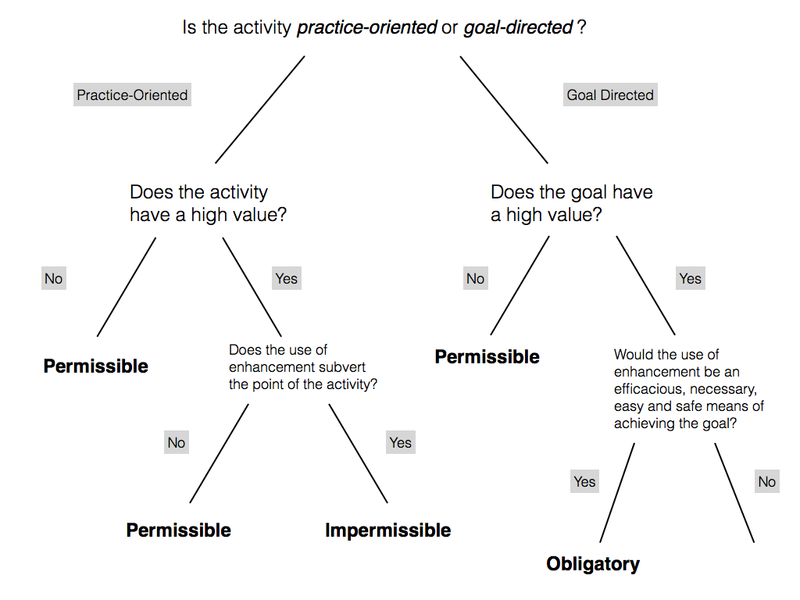 Permissibility Test: If the activity is (a) practice-oriented but lacks a valuable point; or (b) goal-directed, then the use of enhancement should be permissible in that particular activity. Obligatoriness Test: If the activity is (a) goal-directed; (b) has a high value; and (c) the use of enhancement is a necessary, efficacious, easy and safe means of achieving that goal, then the use of enhancement should be obligatory in that particular activity. Anyway, that’s it for this post. As a final note, I would like to point out that Santoni di Sio and his colleagues’ work on this framework is part of a research project called Enhancing Responsibility. The project is being jointly run by TU Delft in the Netherlands, and the University of Oxford. I would recommend checking out some of the other work being done as part of that project. I must start off with an apology. I started a journal club initiative back in May, with the aim of doing one per month. As you may have noticed, I have been terribly remiss in the interim, failing to do any over the past two months. This is one of my general character flaws... I have, however, been doing some thinking over that period of time about what I want to the journal club to achieve and what shape I want it to take. I have decided that I would like the journal club to focus on topics that broadly lie within the philosophy of religion. Why limit it in this way? Well, the philosophy of religion is one of my long-standing interests. In fact, it tended to dominate the early content on this blog. But my primary research and teaching interests do not lie in this area (I focus on ethics, emerging technologies and law). Consequently, I'm looking for an excuse to keep up with the latest research in the philosophy of religion. My hope is that the journal club will give me that excuse. Of course, that's not all I'm hoping for. I know I have a lot of readers who are interested in the philosophy of religion too, and I'm hoping the journal club will give them an excuse to debate and discuss the latest research in this area as well. Dagfinn Sjaastad Karlsen 'Is God Our Benefactor? 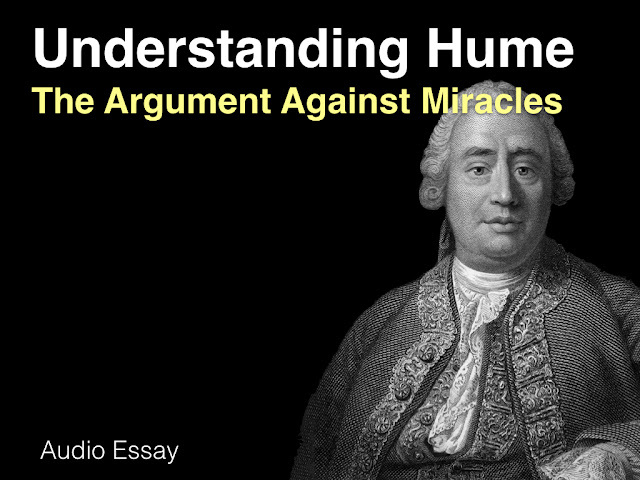 An argument from suffering' (2013) 3(3) Philosophy of Life 145-167 - This is an interesting paper in that it tries to unite the problem of evil with some debates in population ethics. In essence, it tries to argue that God had no morally sufficient reason for creating us because bringing us into existence did not benefit us (in fact, it may even have harmed us). I'm not sure it is entirely successful in making this core argument, but it provides plenty of food for thought. The discussion about this will begin on the 20th of August 2014. Sharon Street 'If Everything Happens for a Reason, Then We Don't Know What Reasons Are: Why the Price of Theism is Normative Skepticism' in Berman and Kain (eds) Challenges to Religious and Moral Belief: Disagreement and Evolution - I'm a big fan of Sharon Street's work on metaethics, and so this paper naturally caught my eye. I think it makes a very significant and wide-ranging argument -- viz. that theism undermines many of the normative judgments we take for granted. The discussion about this will begin on the 3rd of September 2014. Both of these papers are available for free online. And in future I'll make sure that every paper that features on the journal club is available for free (I've learned my lesson from the first attempt). I do hope you can join in the conversation about these papers.